When my kids catch a glimpse of lightning bugs for the first time one summer, they assume they’re battery powered. “Are those little flashlights attached to anything?” they ask. They grab jars from the kitchen and try it for themselves. I watch them and find myself feeling nostalgic for the invincibility of childhood. If we jump, our mom or dad will catch us. 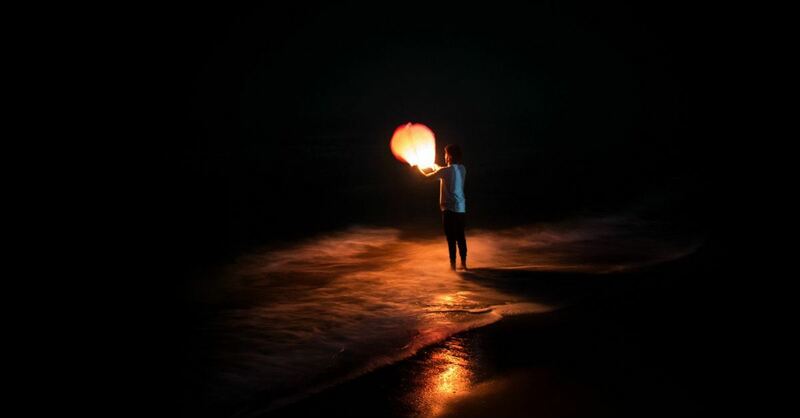 If we want to find magic, we need only look for a firefly. The first year after Cameron goes missing, it’s my inner child—the one who still believes in the magic of lightning bugs—that hurts the most. A few months after that firefly night, my family is playing a round of cards. We’re trash-talking and laughing, when my phone interrupts our fun. My mother is on the other end, frantically explaining that Cameron was hiking in Oregon and that we all need to pray. She implores us to help call the Oregon Park Service. Three years later, the Crater Lake park ranger’s number is still EXPO’d on the whiteboard in my kitchen. Putting together clues and tracks, the best guess we can come up with is that Cameron, my cousin and childhood friend, fell from a snow-covered cornice into the waters of Crater Lake—a two-thousand-foot-deep body of water famous for its startling beauty. The night of Cam’s funeral, his rugby buddies and our family release paper lanterns into the night. We stand there for a very long time, watching the lanterns float across the starry Nashville sky. Some lanterns unite and form the letter C, as if they are honoring Cameron with us. Even now, in the daylight, my aunt, Cameron’s mom, notices clouds in the shape of the letter C. She can’t help but wonder if it’s her imagination or a supernatural gift of love. “Hugs from heaven,” she calls them. Like most of us do in grief, I want to make sense of nonsense. I want my questions answered so that I can write a good sermon on the topic. But there are no remains of Cameron and also oh-so-many remains: the gorgeous photo of Crater Lake he texted before his fall, all of our lingering questions, all of our memories and stories. Where is the hope in a tragic, sudden death like his? Where is God’s presence in freak accidents? How do you find God’s love in a thing that feels so loveless? God, can your love show up, even here? In other words, not all suffering is reasonable. Not all agonizing questions can be answered sensibly, especially in losses like these. In our deepest grief, we don’t lament (cry out to God) to find answers. We lament to stop searching for them. We lament to be still in the unanswerable. Because she is so uniquely impacted by Cameron’s death, I know it’s probably unfair of me to look to Cameron’s mom to learn how to grieve—especially in the first year following his death. Still, I find that she is helping me find God’s love in this. She and my uncle have such huge hearts. In the year following their son’s death, they start a scholarship in Cameron’s name. They build a memorial bench at Crater Lake. They bless others. They scatter love everywhere they go. 3. It’s Okay to Yell and Scream at God – Really. There are many evenings in the year following Cam’s accident when I continue to ask God my questions and receive no answer. I yell and scream at God for doing this to our family. I tell him I don’t believe in him anymore. Of course, the irony is that the whole time, I’m still talking to God. And he lets me. As David grieves his beloved Jonathan, he doesn’t ask why. He simply declares this well-known lament, “How the mighty have fallen. . . . I grieve for you, Jonathan my brother; you were very dear to me” (2 Samuel 1:25-26). I am grieving for you, Cameron, my brother. You were very dear to me. Empty chairs sit at empty tables that once were full of you. In spite of what people say, the first year of grieving a loved one is not always the hardest year. In fact, sometimes the years that follow are more difficult because reality sets in. But the first year is the year of adrenaline. The year of firsts. The year of putting one foot in front of the other. The year of doing the next thing you are capable of doing. The year of thinking through new systems and new structures in place to make your life livable. It’s a year of reckoning—a year of listing that which has been lost, and trying to make sense of what will never really make sense—this new reality. It’s now been four years since Cameron died and God never swept in like Superman to fix it, never traveled back in time to stop it from happening. God never truly answered my grief- questions the way I wanted him to. But sometimes, it’s only in looking back that we see clearly. As I look back now, over that first year, even in this horrible circumstance, I can see God’s hand of love touching everything. God’s love is in the encouraging texts from my sister-in-law. God’s love is in the kindness of the park ranger allowing a memorial bench to take up space on national park property. God’s love is in the tearful phone calls with my aunt, in the photo Cam sent us before he died. God’s love was even with Cameron as he died, doing what he most enjoyed. God’s love is in the symbols, symbols that we were created to need—the Cs in the sky, the floating lanterns, even in tattoos that our family got in Cam’s honor, and a million more like them. God’s love has shown up in all of these miniature miracles. Instead of answering our grief with explanations, God shows up in our pain. Surely, this is a God in whom all lament songs become love songs. Though death feels like the opposite of love, God showed us his own love in dying for us, in overcoming death for us. So are death and love opposites after all? In Jesus, perhaps not. In him, one can be the means to the other. Dear one, as you grieve this first year, may you continue to tell stories, light lanterns, honor your lost ones in the ways you see fit, and find childhood wonder and God’s presence even in your darkest hour. He is near, showering you with love. Adapted from The Louder Song: Listening for Hope in the Midst of Lament by Aubrey Sampson. Copyright © 2019. Used by permission of NavPress. All rights reserved. 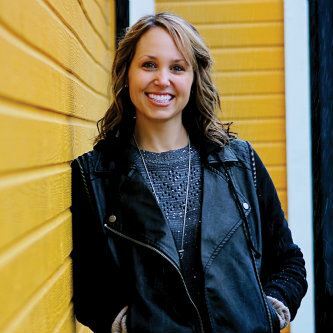 Represented by Tyndale House Publishers, Inc.
Aubrey Sampson is the Director of Discipleship and Equipping at Renewal Church in the Chicago area. A speaker, writer, and church planter, Aubrey offers an incredible perspective in the midst of trying experiences. She is the author of Overcomer, writes for Propel Women, and is a member of the Redbud Writers Guild. Aubrey enjoys hanging with her family, binge-watching Netflix, and collecting vinyl—mostly because she believes that no matter the difficulty we face, God turns the record over and writes a new song. Aubrey is currently earning her Masters in Evangelism and Leadership. You can read more from Aubrey on her website, or get in touch with her on Facebook, Twitter or Instagram.